Important article by my friend, Dr. Lisa Weinstock-Finkel re latest ways to diagnose breast cancer in earliest stages. It’s that time of year again – October is breast cancer awareness month; pink everywhere – even the Giants are donning pink! But aren’t we already aware of breast cancer? We all have been directly or indirectly touched by this disease. Maybe we are being made aware in order to remind us to get a mammogram? Early diagnosis saves lives – right? tissue – that’s what dense means – are white and obscure the cancers which also appear white. A mammogram on dense tissue is like a car with a blind spot – the cancer might be there, you just can’t see it. Recent studies have shown that having dense breast tissue is in itself a risk factor for developing breast cancer – up to 4-6 times the risk when compared to women with fatty tissue. Supplemental screening is helpful in dense tissue because the images show tissue and tumors differently. Ultrasound, Magnetic Resource Imaging (MRI) and Molecular Breast Imaging (MBI) are excellent at finding cancers in dense tissue. Mammography is still the gold standard because it has been proven time and again to save lives. Women with dense breast tissue still need mammograms because there are abnomalities that are only seen in with mammograms such as micro calcifications. Your breast cancer awareness starts with a mammogram – but it’s just that – a start. Digital Mammography – One day we read that mammograms are great and the next day that they are useless! What’s the truth? Mammography is excellent at finding cancers in women with fatty tissue. Briefly, breast tissue is made of glandular, fatty and fibrous tissue. At this time almost all radiology centers have replaced the older film screen mammography with digital mammography as digital provides images that can be analyzed faster and stored and shared more easily. Performing hand held ultrasound requires experience and expertise of both the ultrasound technologist and radiologist scanning the Breast. In untrained hands cancers are missed (false negatives) and too many insignificant findings wind up being biopsied (false positives ). Screening ultrasounds unfortunately are not considered covered procedures by insurance and most facilities/hospitals do not offer screening breast ultrasound. Automated Breast Ultrasound (ABUS) – This new device uses the same technology but the transducer is automated, so it is less labor intensive and less dependent on the technologist’s skill. It requires less time to perform and takes the subjectivity out of scanning. As of now it has not been proven to find more cancers than hand held breast ultrasound when hand held is performed in experienced hands.This technology will likely revolutionize the way women with dense breast tissue are screened in high volume practices that do not have the resources or the experience in performing hand held breast ultrasound. Breast Tomosynthesis – also called 3D mammography, utilizes digital mammography machines and acquires images at multiple angles. The images are then reconstructed reducing or eliminating tissue overlap in areas of concern on dense tissue. It is a great technology for large volume practices and hospitals who perform screening mammograms that are read by the radiologist after the patient leaves the center. Tomosynthesis has been found to decrease patient call backs by 30 percent. The downside to tomosynthesis is that you are exposed to double the amount of radiation compared to a standard digital mammogram. Though it decreases patient call backs, studies have not yet demonstrated that tomosynthesis finds more cancers than mammography with the addition of ultrasound. Molecular Breast Imaging (MBI) – With MBI, a woman is given an injection of a short-lived radioactive agent. This material accumulates in tumor cells more than it does in normal cells. Using a gamma camera, tumors show up as hot spots, or black spots, on the resulting image. This technology does not look at the anatomy of the breast as a mammogram or breast ultrasound does; it examines the ACTIVITY of the breast tissue. This is a great technology for women with dense breast tissue, high risk patients and women with breast implants. MBI is made by several different companies. I use a system made by DIIlon Diagnostics called Breast Specific Gamma Imaging (BSGI) in my practice. In a recent Mayo Clinic study comparing MBI with mammography, MBI detected three times as many cancers in women with dense breast tissue. MBI also demonstrated fewer false positives than Breast MRI. Studies have demonstrated that MBI is more sensitive in finding invasive lobular cancers which are often hidden on mammography, Ultrasound and in physical exams. The drawback of MBI is radiation exposure, limited availability and cost. Magnetic Resonance Imaging (MRI) –– Magnetic resonance imaging (MRI) is a noninvasive medical test that uses a powerful magnetic field, and produces detailed images of the breast tissue. It utilizes an intravenous injection of contrast. MRI does not use radiation. MRI looks at both structure and blood flow, with cancers showing increasedareas of blood flow. 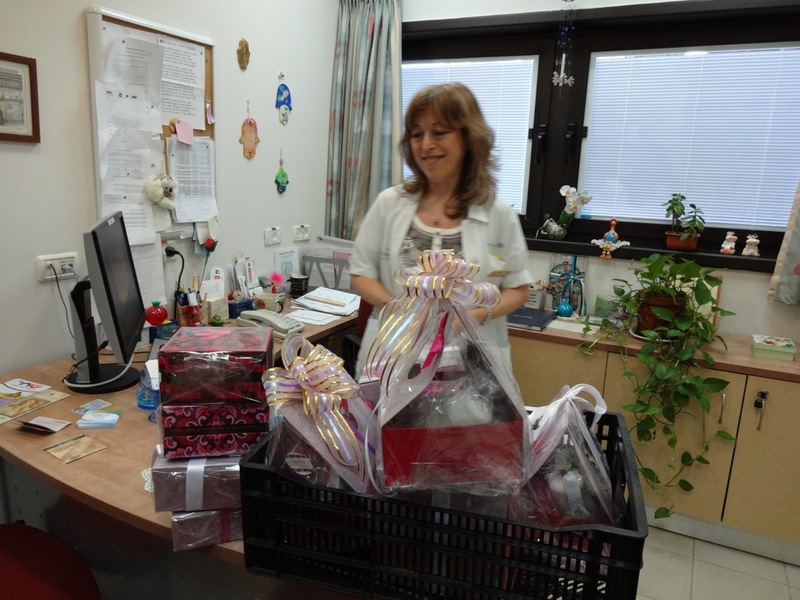 A huge thank you to a young woman who did an exceptional thing recently for the staff and patients at the Meir Hospital Breast Center in Kfar Sava, Israel. Jennie Kaufmann, 12, from Raanana, Israel, took on a Chesed project in honor of her Bat Mitzvah which was straight from her heart. 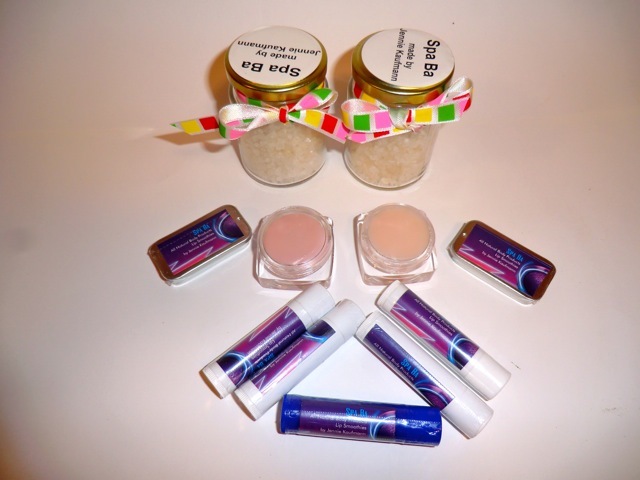 Jennie has a talent for making all kinds of soaps and beauty products that are gorgeous and all natural. (This hobby is turning into a fledgling business. 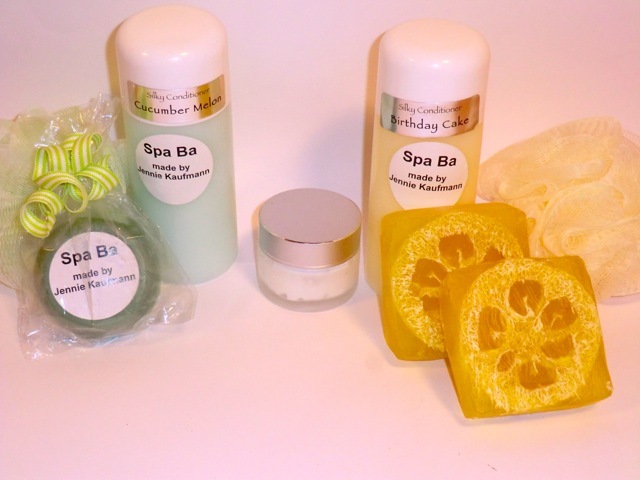 I plan to be one of her best customers…let me know if you want in…) She also designs lovely gift baskets. Jennie heard about the Lemonade Fund (www.lemonadefund.org) and decided that she wanted Lemonade Fund grant recipients, or any other woman newly diagnosed with breast cancer, to receive her gift baskets. Together with her mother and sister, she met with Dr. Amalia Magen, Dr. Tzvi Koyfman, and others from the staff at the Meir Hospital Breast Center. 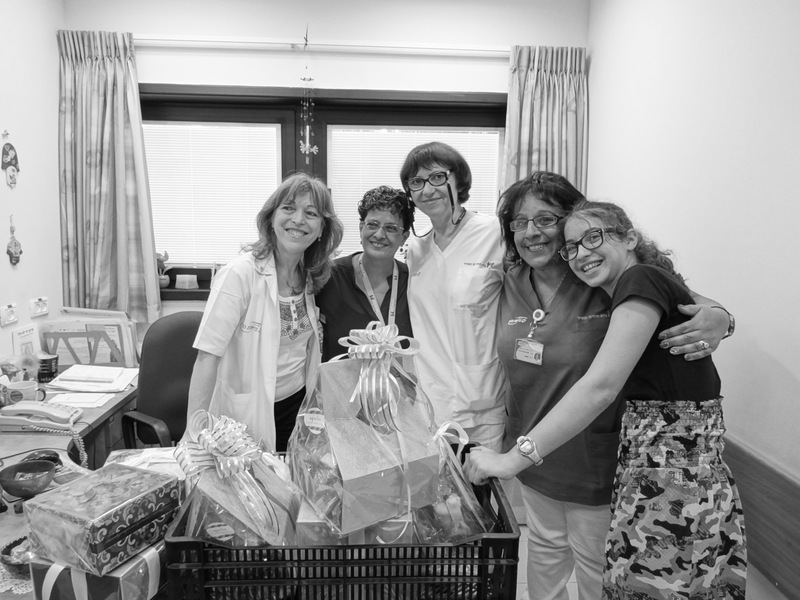 In addition to learning a bit about the current state of breast cancer diagnosis and treatment, she delighted the staff with her personality and her beautiful gifts. She will surely brighten the days of those women coming in for dreary doctors appointments. How dark and fearful those early days can be! How lovely to leave with a surprise gift that shows such care and thoughtfulness. I understand from her Mom that Jennie also decided to donate a portion of her Bat Mitzvah gift money to the Lemonade Fund. It is refreshing to hear about a young girl who intrinsically understands that a Bat Mitzvah is about something larger than herself. Jennie seems to get that coming of age means being part of the wider human community where we all responsible for one another. Many thanks, Jennie.